BritMums has teamed up with Kellogg’s to host a fabulous competition for our children to unleash their creativity and to make breakfast time a bit more fun. 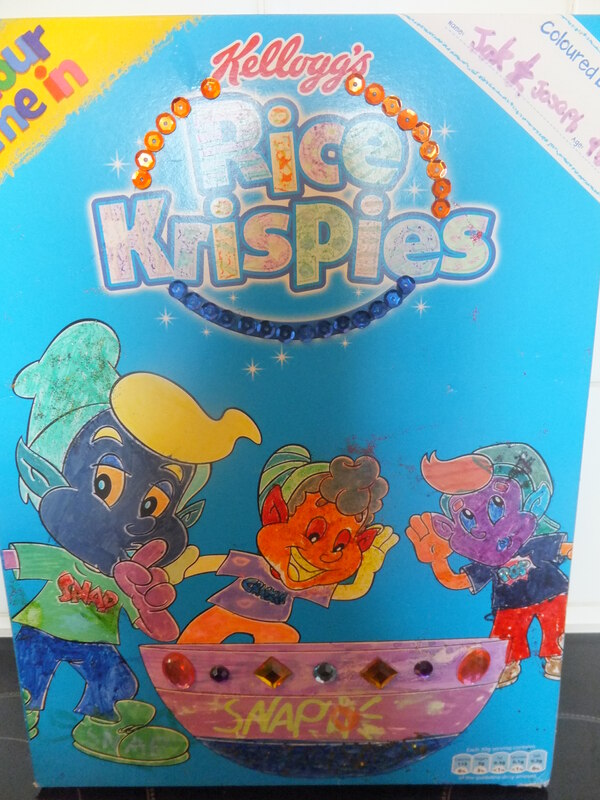 Kellogs have replaced the regular front of its Rice Krispies boxes with a colour-in Snap, Crackle and Pop, so children can decorate the characters and personalise their breakfast. We was sent a large box of colour me in rice krispies and a bumper colouring case which includes 58 different pens, pencils, glitter glues and markers, all the boys had to do was decorate the box with their own personal touch. Jak and Joseph quickly got stuck in colouring, stamping and glueing. Joseph’s favourite part was putting all the glitter glue all over the box as he really enjoys the messy part of art. Jak has been doing pop art in school so he decided he wanted to test what he has learnt on to snap, cackle and pops faces. My boys really enjoy doing art and i am always encouraging them to do some drawing or painting so this competition was right up their street. They stuck on jewels and put glitter all over the box now our breakfast in the morning couldn’t be more sparkly and colourful. 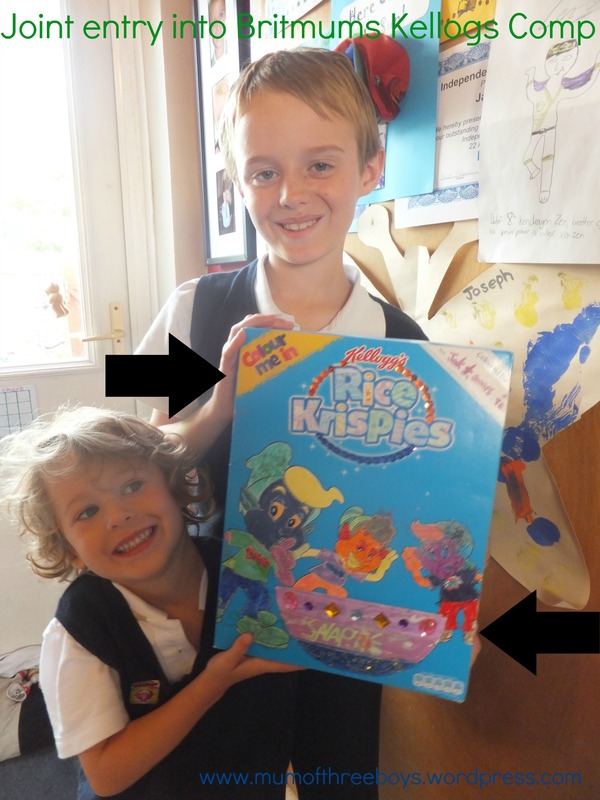 The boys had lots of fun colouring and designing their own personalised breakfast cereal box, Joseph now wants to eat Rice Krispies every morning and they now look forward to waking up to their bright breakfast. We even made some yummy Rice Krispies marshmallow cakes, they went down a treat especially after all the hard work the boys put into colouring in their box. 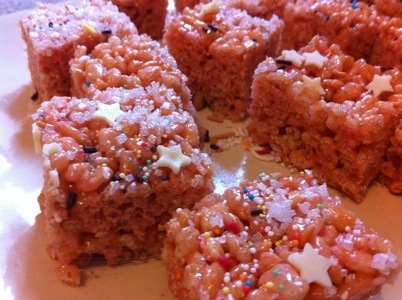 Made with 75grams of melted butter, 150grams of melted marshmallows and mixed into 100grams of Rice Krispies and decorated with lots of undred and thousands, chocloate stars and edible glitter. This is our entry into the competition to be in with a chance of winnign £500 cash and the boys design printed on to a t-shirt.WOW! Thank you to Kellogs for sponsoring this fab comp for the children and Britmums for hosting it.